The events in Japan are horrific. Truly, truly horrific. As painful as it is to watch the events unfold, it's equally painful to watch the fear-mongering going on around the world. I grew up in a house 26 miles from Three Mile Island and I was in the eighth grade when it experienced a partial core meltdown. The entire world freaked out when TMI was happening and I remember getting caught up in it. Granted, I was 13 years old at the time. Boy do I remember keeping the blinds drawn and not being able to go outside for recess. I remember too the absent kids whose parents decided to flee. But despite the partial core meltdown and the release of radioactive water and steam, nothing happened. South Central Pennsylvania is an agricultural area and there was no increased incidence of two-headed cows or mutated corn. 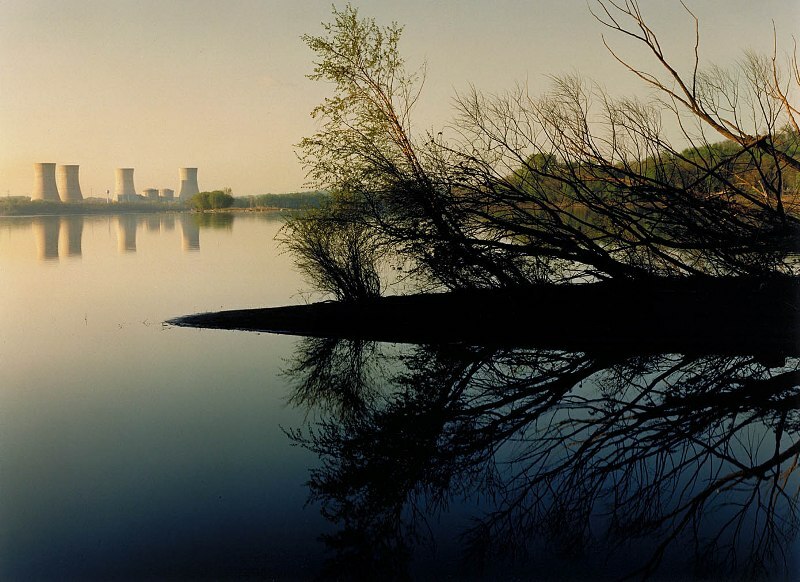 Study after study has shown conclusively that the people surrounding Three Mile Island suffered no ill effects. I can tell you the same thing as someone who grew up close to Three Mile Island. I don't have three arms nor do I have an increased chance of getting cancer despite my love for the Susquehanna River and the manure-scented air of Pennsylvania. The troubled nuclear plants in Japan will be contained and the Japanese people will rebuild their lives and their country. Count on it. Just as equally, you can count on the anti-nuclear people to use the tragedy in Japan to try to stop further investment in nuclear power. Most people don't understand what ionizing radiation is and have not idea that they're exposed to it constantly. Further, they have no idea that the Pacific coast of North America is at no risk for ill effects from the events unfolding in Japan. Here's a table that explains radioactive exposure in a very straightforward way.Many thanks to my cousin Tim for passing this along to me. We cannot continue to burn stuff to make electricity, that much is clear. Between rising sea levels, peak oil and melting icecaps, burning fossil fuels represents a bigger problem than any nuclear power plant can. 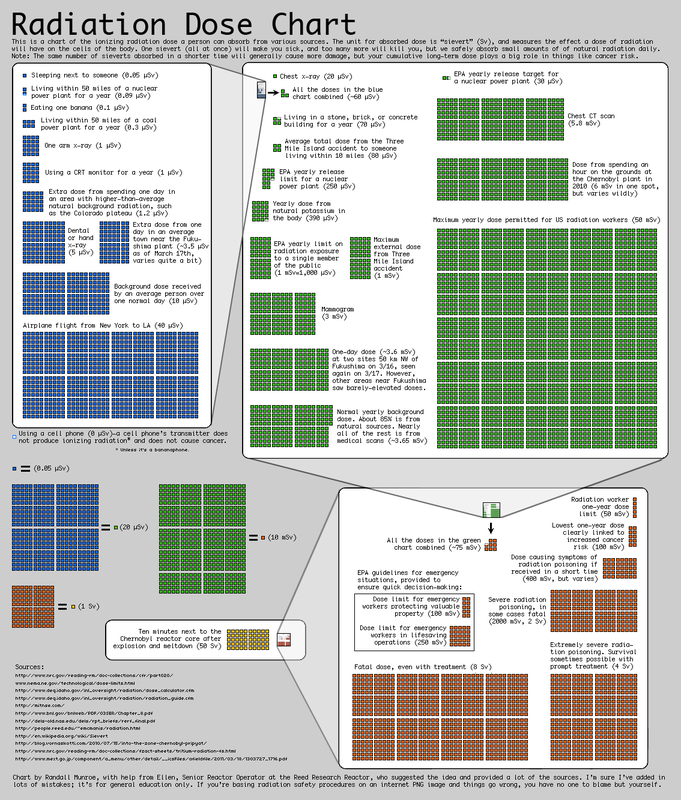 Until the inefficiencies of wind power and solar power are addressed, nuclear is the best option we have. You're free to disagree with me of course but I ask that you do so rationally. And whether you agree with me or not I ask that you pass along that table. I'll disagree only in the respect that for whatever reason, in North America nowhere near enough effort is being put into other sources of energy. Wind power generates 30% of the energy requirements in Denmark. Solar and wave technologies can provide similar benefits. Time for us to wake up. The energy future is in the waves and tides and yes, nobody in North America spends nearly enough money on R&D. I'm not being dismissive of the tragedy unfolding, but I think we need to respect their ability to help themselves and not be so quick to decide for them what is best just so we can feel good about ourselves. And we can't keep burning stuff for energy. More people have died extracting coal from the ground than have died from producing nuclear energy. To listen to all those idiot experts with their worst case scenarios on cable news.. I finally just had to shut it off; it was getting silly. 24 hour cable news is the worst development in human history. Turn it off and leave it off. I swore off the stuff years ago and I feel like I'm better informed now then I was when I on the cable news train. By reading my news rather than watching it, I have to do the work of figuring out what it means. In traveling this winter I did get the chance to watch a good bit of Al-Jazeera. It's amazing to watch a news broadcast that's devoid of punditry. Ask your cable company to start carrying it. I have. Repeatedly. I'm not holding my breath. My boyfriend is currently working on his PhD in nuclear engineering, so I consider myself pretty well educated when it comes to nuclear issues. And I can't tell you how glad I am to see that there are a few people in this world (not in the industry) that do actually get it. Thank you. It's my pleasure Jessica. Conventional wisdom when it comes to radiation is pathetic as you're well aware. For a week we've been hearing the screams of the scientifically ignorant as they call for zero tolerances when it comes to acceptable levels of radiation exposure. Um. Really? You're going to eliminate radiation? That kind of ignorance drives me crazy and the paranoia surrounding radiation and radioactivity actually holds us back as a society.